FREE TOUR CARTAGENA informs users of the website about its policy regarding the treatment and protection of personal data of users and customers that may be collected by browsing or contracting services through its website. 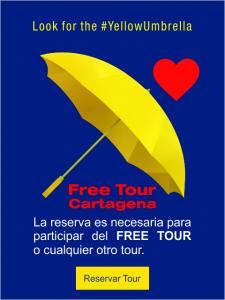 FREE TOUR CARTAGENA has the duty to inform users of its website about the collection of personal data that can be carried out, by sending email or filling out the forms included in the website. FREE TOUR CARTAGENA will be considered responsible for the data collected through the means described above. FREE TOUR CARTAGENA informs users that the purpose of processing the collected data includes: The attention of requests made by users, the inclusion in the contact agenda, the provision of services, the management of the business relationship and other purposes. The operation, management and technical procedures that are carried out in an automated or non-automated manner and that make possible the collection, storage, modification, transfer and other actions on personal data, are considered as treatment of personal data. All personal data, collected through the FREE TOUR CARTAGENA website are considered to be personal data processing, and in accordance with the principle of accuracy or quality, FREE TOUR CARTAGENA is committed to the truthful, complete and verifiable treatment of all the information that is provided to you prohibiting partial, incomplete, fractional data or that misleading error. Similarly, it shall take technical, human and administrative measures to ensure the security of personal data processed, thus avoiding adulteration, loss, consultation, use, or unauthorized or fraudulent access. FREE TOUR CARTAGENA informs users that their personal data will not be transferred to third parties, with the exception that the transfer of data this covered on a legal obligation or when the provision of a service implies the need for a contractual relationship with the staff responsible for the processing of the data. In the latter case, only the transfer of data to the third party will be carried out when FREE TOUR CARTAGENA has the express consent of the user. In accordance with the provisions of Law 1581 of 2012 on data protection, it gives interested parties the possibility to exercise a series of rights related to the processing of their personal data. As the user data are processed by FREE TOUR CARTAGENA users may exercise the rights of access, rectification, cancellation and opposition in accordance with the provisions of current legislation on data protection. In the exercise of these rights, the user must contact us by written communication, providing the documentation that proves his identity, to the following address: Adriana Building Manga neighborhood, Postal Code: 130001, City: Cartagena, State: Bolívar. Such communication should reflect the following information: names of the user, subject, address and supporting data. The exercise of rights should be performed by the user. However, they may be executed by a person authorized as a legal representative of the authorized. In this case, the documentation that accredits this representation of the person concerned must provide.